The Seminary community maintains archival records of the important events which transpire throughout each year. 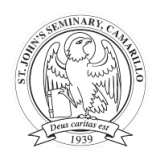 The student archivist compiles, preserves and periodically displays the literary and photographic record of seminary activities. The care and preservation of the Ordination Gallery is an important aspect of the archival treasury. The seminary book service system serves the needs of students and faculty at the beginning of each academic semester. Payments may be made by cash, check or accepted credit cards. Methods of payment are to be arranged and approved by the Business Manager. The canteen is a student store operated under the auspices of the Student Senate and the supervision of the Director of Students. A student manager is appointed to administer the operation of the canteen. The canteen is designed to meet the supplementary needs of the student community. The canteen is established to operate on a nonprofit basis. Any incidental profit that may be made from the operation of the canteen reverts to the Student Senate. A yearly audit is conducted and the report is made available to the members of the student body. A student infirmarian is appointed by the Director of Students. Students who are in need of medical supplies or assistance may contact the student infirmarian. Students who are ill and in bed may contact the infirmarian in order to have meals brought to their rooms and to notify the Director of Students of their illness. Laundry facilities supported and maintained through student fees, are provided in the basement of St. Thomas Hall for use by members of the theology community only (students, faculty and employees). All students and those faculty members who wish to use the laundry facilities, are charged an annual fee. Seminary employees may use the facilities as guests of the student body. Specific privileges, responsibilities and courtesies apply to the use of laundry facilities. A student kitchen is provided in the refectory building, adjacent to the faculty dining room, for use by those students who wish to prepare meals for themselves. A student is appointed by the Director of Students to supervise the use, stocking, and maintenance of the student kitchen. It is not the sole responsibility of this student to clean the facility. Students who wish to use the kitchen are responsible for maintaining and cleaning the facility. Failure to do so results in losing the privilege of further using the kitchen. After cooking, students are to clean all dishes, pots and cooking utensils, wipe clean all food preparation and serving areas, sweep and mop the floor, replace all items to their proper place, and remove from the kitchen all food items not consumed. Uneaten food is not to be left in the refrigerator nor exposed on a cabinet top or table. Food preparation items stored in the refrigerator or kitchen for later use should be clearly marked with the student’s name and are not to be disturbed by other students using the facility. Unmarked items and uneaten food left in the refrigerator or the kitchen may be removed at any time by the student in charge of supervising the facility.